You may not know this, but we LOVE Minted. And, more importantly, we love YOU, our readers. That's why we've teamed up with Minted to give away an incredible $1,000 in Minted goodies to one lucky winner! That's $1,000 you could use to finish up all your holiday gift giving, to decorate your home, or to just get some much needed retail therapy. If you're short on square footage, walls can be a valuable and under-utilized storage area in the home. There are tons of wall-mounted storage and organization products out on the market today; here are ten of my favorites. January may be coming to a close, but there are still eleven months left in the year. Celebrate the date with this large DIY calendar with prints from your Instagram account! The pain of dusting this shutter wall just might be worth it. Olive and Love was the genius behind it. To see more of the process, go here. Starbursts and typography. Two words that were oh-so-hot for artwork in 2011. 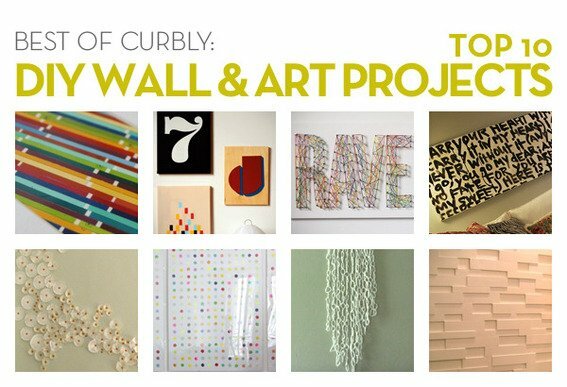 Another two words that came to mind rounding up our hands-down-favorite art/wall projects were 'unusual uses.' From cupcake liners to shoe polish, the materials used by these creative individuals was nothing less than inspirational. And did we mention that the resulting artwork was outstanding as well? No sir, I don't think white walls are boring... they are merely just a canvas for something awesome! I am a big fan of stark white walls filled with colorful collages of artwork. I appreciate it in my own home as well as others. For me they evoke the feeling of a light and airy space and I love pops of color scattered throughout. Today I was crafting with a friend who has a fab little bungalow in the Venice Canals part of LA and she also loves her bright white walls... And her place still has lots of personality from the interesting and colorful artwork and accessories throughout. Designers are generally smart people. Case in point: the graphic designer office of Oktavilla, which features walls made from recycled magazines. Not some ground up, post-consumer new paneling product, but actual magazines. Reclaimed gym floor wall hooks?? How clever! 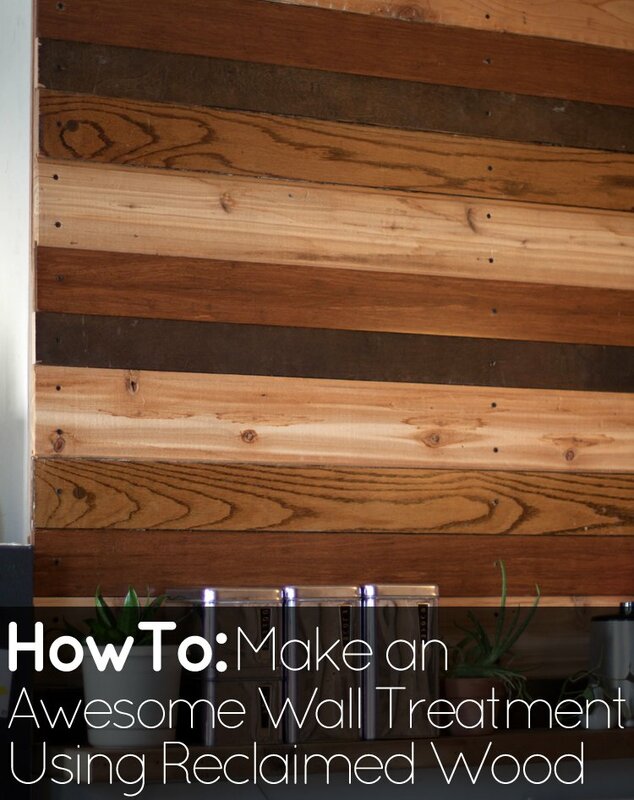 Before you grab your wallet and get to ordering though, check out how to create a reclaimed wood wall treatment. Totally adaptable to a wall hook feature, right? If you're itching for some color, mask off a similar design and grab your favorite spray paint. Easy. Done. For instant gratification, you can purchase the above pictured wall hook from UncommonGoods for $125. In today's video I show you how to do your own Reclaimed Wood Wall. This is a project I have been wanting to do for months and am so thrilled with the result. My husband and I were first inspired by The Antonio Treatment, an HGTV show starring a laid back kinda punk rock/metal dude who does everything green and features his dog Chewie a lot. We dig him. Antonio does BIG heavy hauls and revamps and shows glimpses into the projects, without doing big DIY tutorials. So I thought it'd be cool to take the reclaimed wall idea and break it down for you. How to: Make Boutique-Inspired Butterfly Wall Art on the Cheap! Here is a clever project to add character to your space without taking a lot of cash out of your pocket: paper butterfly wall art. A traditional wall, by definition (I think), is a two-dimensional surface. By extension, wallpaper, traditionally, is also a two-dimensional deal. Painting with Plants - The Living Wall. How To: Repair Damaged Drywall. Any active home eventually results in some damaged drywall. Nail and screw holes, banged up paint jobs, even cavitiy-ish gapes from errant doorknobs, tools, and other sharpies. Thankfully, it's an easy(ish) fix, and HandymanHomeRepair has got a perfect how-to for getting the job done.